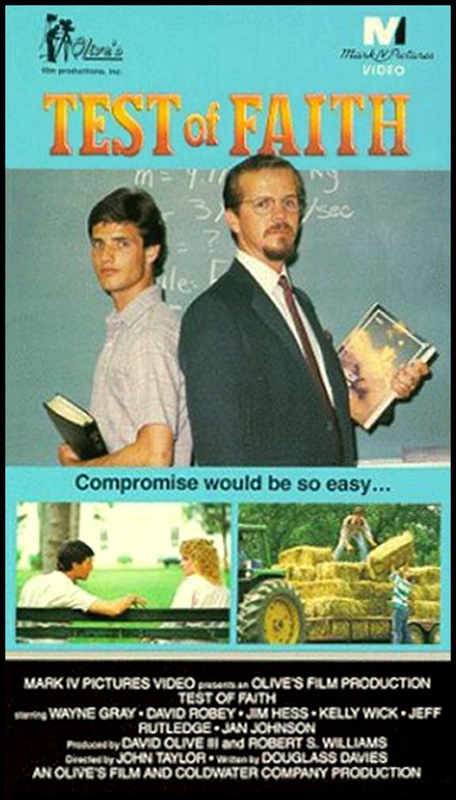 Imagine FOOTLOOSE, except with mostly first-time actors, a public access-sized budget and, instead of dancing, a strong-willed teenager fights for his belief in the Bible! Tackling the 'controversial' topic of teaching evolution, this 55-minute Christian propaganda flick was produced by Madison, Alabama based Olive's Film Productions, who were earlier behind the idiotic anti-rock-'n'-roll diatribe ROCK: IT'S YOUR DECISION. With John Taylor returning as director, it lacks their previous outing's camp value and instead smothers its viewers in soggy, sanctimonious melodrama... It's the first day of college for devout farmboy Taylor Mitchell (Wayne Gray), who has a scholarship to study physics at "one of the most reputable schools available" (even though the place looks like a dinky community college), far from his God-fearing, whitebread family. Straight-arrow Taylor arrives at school in a white shirt and tie, with a Bible at his dorm bedside, and trouble begins when his first class is taught by a smug know-it-all named Dr. Heinlein (David Robey, who earlier played the title role in John Taylor's inspirational drama COACH). He requires all of his students to believe in evolution (horrors! ), makes light of the "mythological concept of a supreme being" (I can't argue with you there) and sports a clearly-Satanic van dyke beard. Poor Taylor needs to maintain a 3.5 G.P.A. to keep his scholarship, but if he decides to remain inside his religious little anti-science bubble, the kid could be on the next bus back home. Fearful that Heinlein (who mocks religion as "an outdated fairy tale") is "trying to tear out his faith by the roots," Taylor consults his trusty Bible for answers, stubbornly refuses to believe his textbook, bickers with Heinlein in the middle of class, and submits assignments that instead reflect his own personal beliefs. Taylor even invites some school pals to spend the weekend with his gratingly-pious family, doing farm chores and going to church. Worst. College. Road trip. Ever!... Shot at Athens State College (Athens, AL) and Calhoun Community College (Decatur, AL), its miserably untalented amateur cast tries their best, while Douglass K. Davies' leaden script only preaches to the choir and makes pompous windbag Heinlein an easy target. Plus the most preposterous, wish-fulfillment sequence is saved for last, when Taylor's Christian term paper is so incredibly moving that it makes Heinlein's small atheist heart grow three sizes that day. But seriously, with so many pinheaded school districts spinelessly capitulating to right-wing zealots and adopting the pseudoscience of creationism, this type of horseshit is more repellant and dangerous than ever. It's no wonder the US educational system is currently ranked 17th in the world, because we've allowed the inmates to run the asylum.